Dental caries, as a result of a disturbance of the ecological balance on the dental hard tissues caused by plaque microorganisms, is one of the most prevalent diseases in children. Among 5–17-year-old Americans, it is more than five times as common as reported asthma and seven times as common as hay fever. In 1981, one of the global goals of the World Health Organization (WHO) and World Dental Federation was to reach a 50% caries free dentition in 5- and 6-year-old children until the year 2000. This aim was, in a global view, achieved widely. In 2003, the WHO and World Dental Federation and International Association for Dental Research suggested to consider the specific values “with regard of the political, socioeconomic, and legislative context” and left the decision about the definite aims to the national level. Thus, the German dental board aims 80% of the 6-year-old children in Germany to have a caries-free primary dentition in 2020. Furthermore, many adults erroneusly believe that “baby teeth” or deciduous teeth are relatively unimportant because they will eventually fall out. Having high caries experience early in life predicts having an increased risk of caries in adulthood. Hence, prevention plays an important role already in childhood. As caries can, depending on the extent, negatively affect the children's ability to eat, sleep, and do schoolwork, therefore, its effect on the overall aims of children's development should not be underestimated. Actions of individuals are associated with both outcome and efficacy expectations. Thus, self-efficacy is an important factor for predicting individual action and controlling subsequent emotional responses. Self-efficacy relates to the belief in one's general confidence to accomplish the actions necessary to reach a goal. When applied to the clinical setting, self-efficacy refers to a child's perception of his or her ability to perform the actions needed to improve and maintain their health. Self-efficacy has predicted a range of health behaviors, including oral self-care. Children's attitudes toward oral health care are built on experience and information acquired from different sources, including parents, teachers, electronic, and printed media. Abu-Elenan et al. (2015) reported that children with a high sense of self-efficacy persisted longer and were more successful on difficult tasks than children with low self-efficacy. Children with a stronger sense of self-efficacy able to manipulate problems and chose to rework more problems than children of the same ability who maintained a low sense of self-efficacy. Preschool and school-age child are eager to learn and explore but may have fears about the oral healthcare environment, personnel, and treatment. The aim of this study was to examine the caries level among elementary school students in Balongsari's working area. Statistical analysis was carried out using SPSS 17 (SPSS Inc., Chicago, USA). Ethical approval for performing this study has been obtained from the Research Ethics Committee of Faculty of Dentistry, Universitas Airlangga, with the number of ethic clearance is 186/KKEPK.FKG/XII/2012. Chi-square test was applied to compare the caries level and the risk factors. Odds ratio and their 95% confidence intervals were calculated. The survey was conducted between August and September 2017. This observational descriptive study was done to find the risk factors for caries in this population. Data were derived from the surveys on 2nd and 3rd graders among elementary students in Balongsari's working area. Ethics approval for doing this study has been obtained from the Research Ethics Committee of Faculty of Dentistry Universitas Airlangga. This research is approved by the Head of Public Health Center in area Balongsari and running with Head of Town approval. Through simple random sampling, six elementary schools were selected among 13 elementary schools. Among 1171 students, 110 students were recruited. There was a questionnaire for each student which was based on the WHO standard. The questionnaire previously had gone through the selection process by community dental health experts in the Department of Dental Public Health, Faculty of Dentistry, Universitas Airlangga, then validity and reliability testing were conducted. Data were collected from these students by interviewing them directly. Caries level was measured by Decayed, Missing, and Filled Teeth (DMFT) index which was an accumulation between the Decayed, Missing, and Filled score and decayed, missing, and filled score. A total of 110 (n = 110) children were included in this study, in which 50% were male (n = 55) and 50% were female (n = 55). Students from 2nd to 3rd grade were chosen based on the highest DMFT counts provided by Puskesmas Balongsari. [Table 1] depicts DMFT scores, [Table 2] depicts DMFT scores based on gender, and [Table 3] depicts the result of crosstab between the risk factors and caries level. Based on the crosstab, if P > 0.05 there was significance between risk factor and caries level. If odds ratio >1 there was an association between risk factor and caries level. If the caries severity is outlined according to the grade level, the results of the study found that participants in 2nd grade had higher DMFT scores (37.3%) than in 3rd grade. The average DMFT score in 2nd grade is 6.7 while the average 3rd-grade DMFT score is 5.2. The results showed that 49.1% of students with low dental health knowledge with high DMFT score and have Chi-square test result P < 0.05 indicating a statistically significant relationship. This result indicates that the knowledge of students is very important in underlying the formation of behaviors that support oral hygiene. Knowledge of oral and dental health is essential for the formation of dental and oral hygiene measures. Maintaining oral hygiene at school age is one way to improve health at an early age. Dental and oral health behaviors are related to the child's lifestyle in maintaining healthy teeth and mouth. This is related to the frequency of toothbrushing, brushing time, how to brush teeth, the habit of cleaning the tongue, the use of dental floss, the frequency of consuming sweet foods and drinks, and visits to the dentist. In this study, there is a significant relationship between caries experience with caries severity which is shown at 49.1% with the results of significance test P < 0.05. The previous caries experience is a powerful indicator for determining the future caries. The children who have caries in deciduous teeth have a tendency three times greater for caries in permanent teeth. Dental caries and grade level can be reviewed from the student's teeth arrangement. Elementary school students have mixed dentition where the primary teeth are susceptible to caries compared to the permanent teeth. This susceptibility is due to the inner factor itself which is the structure of the enamel of the deciduous tooth which is less solid and thinner. It is because enamel contains more organic matter and water, while the minerals amount is less than the permanent tooth. Children have the highest caries risk when their teeth are newly erupted. The time of eruption of the first permanent molars faster than the other molars causes these teeth to be susceptible to caries because at this time the occlusal surface of the first molar teeth is developing. In the study on the picture of dental and oral health status of elementary schoolchildren, it is suggested that children with higher grade levels tend to have more knowledge about oral hygiene so that they maintain and care for the condition of their teeth more than children with lower grade levels. Ease of access to achieve health-care facilities have a considerable influence on promotion and preventive efforts of oral health of the community. One of the factors that support the ease of obtaining dental and oral health is the short distance and time access. Assumed with ease of access to health-care centers, the surrounding population will receive more health information, especially about oral and dental health compared to people who are far from access to health services. The risk factors that could be associated with caries based on our survey are grades, knowledge of oral and dental health, toothache experience, participant not satisfied with the appearance of his/her teeth, participant avoid smiling and laughing because of his/her teeth, and subject was made fun by his/her friends. This study was acknowledged by the Department of Dental Public Health, Faculty of Dentistry, Universitas Airlangga. Weusmann J, Mahmoodi B, Azaripour A, Kordsmeyer K, Walter C, Willershausen B, et al. Epidemiological investigation of caries prevalence in first grade school children in Rhineland-Palatinate, Germany. Head Face Med 2015;11:33. Shi C, Faris P, McNeil DA, Patterson S, Potestio ML, Thawer S, et al. Ethnic disparities in children's oral health: Findings from a population-based survey of grade 1 and 2 schoolchildren in Alberta, Canada. BMC Oral Health 2018;18:1. Abu-Elenan NR, Abdella NH, Elkazaz RH. Effect of an oral care educational program on the knowledge, practice and self-efficacy among school age children. Int J Res Stud Biosci 2015;3:53-61. Walsh M, Darby ML. Dental Hygiene. Missouri: Elsevier Health Sciences; 2015. Herijulianti E, Indriani TS, Artini S. Dental Health Education. Jakarta: Buku Kedokteran EGC; 2001. p. 98. Asgari I, Ghanea N. The association between caries in primary teeth and permanent molars' health in 9 years old children. JDM 2017;30:97-103. Duangthip D, Gao SS, Lo EC, Chu CH. Early childhood caries among 5- to 6-year-old children in Southeast Asia. Int Dent J 2017;67:98-106. Marotz LR. Health, Safety, and Nutrition for the Young Child. USA: Cengage Learning Inc.; 2008. Meishi PR. The correlation between consumption of cariogenic food with dental caries in Muhammadiyah 08 Private Elementary School Children. Medan; 2011. 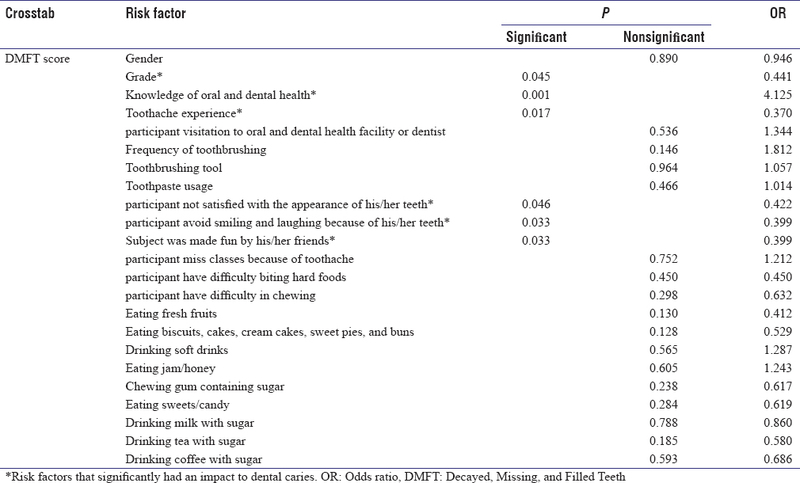 Albino J, Tiwari T. Preventing childhood caries: A review of recent behavioral research. J Dent Res 2016;95:35-42.